NITDC has a wide array of advertising and marketing opportunities available to build exposure for your company and market your products and services to a large, targeted audience. Explore them today and create an influential marketing experience for your company and brand. It’s time to get the word out! Contact our office to market your brand and advertise your business or festival in upcoming Indiana State Publications. Millions of vehicles travel the Indiana Toll Road annually. 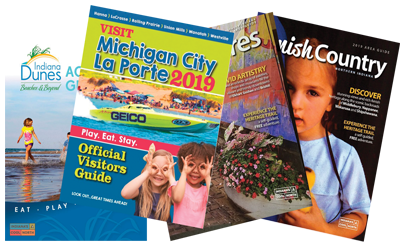 Explore opportunities that give your message for maximum exposure to all travelers, including the Indiana Toll Road Visitors Guide.